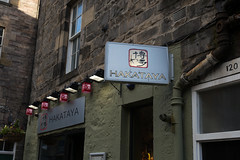 Hakataya is primarily a ramen shop, with a variety of ramen soups based upon different broths, with a modest selection of sushi, potstickers, and other Japanese items in addition to the ramen. 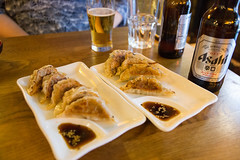 Having a rather large bit of residual hunger from our travels, we started with two plates of potstickers, one pork and one vegetable, and these turned out to be very good: both had very flavorful and well-spiced fillings, the wrappers nice and soft yet having a good sear. A good, enjoyable start to the meal. For the ramen, I opted for their extra-spicy Hell Ramen. Unlike a lot of ramen places these days, Hakataya makes their own noodles, and the results show. The texture of the noodles is perfect: a little springiness. A little toothiness. Cooked to the point they don’t take gummy, and are starting to enjoy the broth. The hell broth was a slightly thick red soup, and despite the focus on the hot peppers, underlying it all is a good, well-done bone broth. A few slices of nicely seasoned pork, a few veggies, and a perfectly cooked egg, and this was a seriously enjoyable bowl of ramen. Carol, meanwhile, opted for the Yokohama ramen, and this too was a well-composed bowl of ramen. 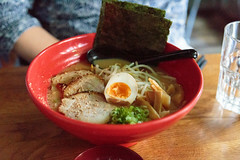 More of a classic ramen, this was a much lighter broth without the heat, but was otherwise the same basic concept: a noodle-forward ramen soup, with perfect noodles, a good broth, and good toppings. Carol was quite satisfied as well. Overall, Hakataya is not just a good ramen shop, but a great one. 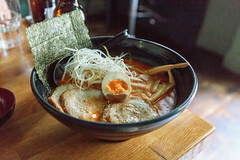 This is easily as a good a ramen shop as, say, Bone Daddies, and they are obviously working on maintaining a great product. If I had to nick them on something, it would be price (My ramen was a hefty 14 quid, the sting only slightly reduced by the Brexit-related lowering of the exchange rate). But hey, at least I’m getting some top-rate rate ramen for that. I wouldn’t mind a return visit. Did you try The New Club? The menu seemed interesting enough and the prices seemed reasonable. I wonder what was on the buffet mentioned on their website? We had breakfast each day at The New Club. It was quite good, actually, although you do need a member or recognized guest to get you in there.